14Paws.com shares the latest, best, and funniest animal videos for viewing enjoyment. Animal fans and science followers will be thrilled to know that a video-sharing website, 14Paws.com, has launched. Curious consumers can view hilarious, fun-loving, or even educational videos of animals of all kinds, such as adorable kittens and kitty cats, playful puppies and dogs, talking birds, even reptiles, marine life, and other types of mammals. “Most of us love to watch animal videos. Why? There can be no other reason than fascination. But most of all they make us laugh, bring us joy, and take our minds off of our own problems,” says John Carson of 14Paws.com. The website’s ease of use and navigation will draw many animal enthusiasts. The home page instantly grabs interest as videos are displayed in list or thumb view. Through easy access tabs at the top, the website is streamlined to easily find the latest trending video or type of animal, and fans can interactively vote for a favorite. “As animal lovers ourselves, we are pleased to offer this website. There’s nothing better for us than to know we are bringing joy to the world by making animals of all kinds accessible to all,” says Carson. Involvement is key to a successful video-sharing website. Access to an account on the site allows people to upload their own videos, share their favorites, and contribute as a top enthusiast. “We wanted fans to be involved, kind of like social networking. So we made the website with that in mind in hope of lots of interaction and a community feel,” says Carson. Even if enthusiasts only come to get a laugh, that is the highest ideal for the site. “There is nothing better than laughing hysterically over a Chihuahua imitating humanlike behavior, or the amusement of wild foxes jumping on a trampoline, to wondering how a pug dog can ride a skateboard. We have a fascination with the animal kingdom, and if it’s watching it through a funny animal video than so much the better,” says Carson. There is something for everybody, whether out of curiosity, for laughs, or kids wanting to learn about animals; anyone can glean something from 14Paws.com/. 14Paws.com is a video-sharing website, where animal lovers can view videos of their favorite animals doing interesting, funny, or educational things. To start contributing, laughing, or learning about the animal kingdom, access the website at http://www.14paws.com/. 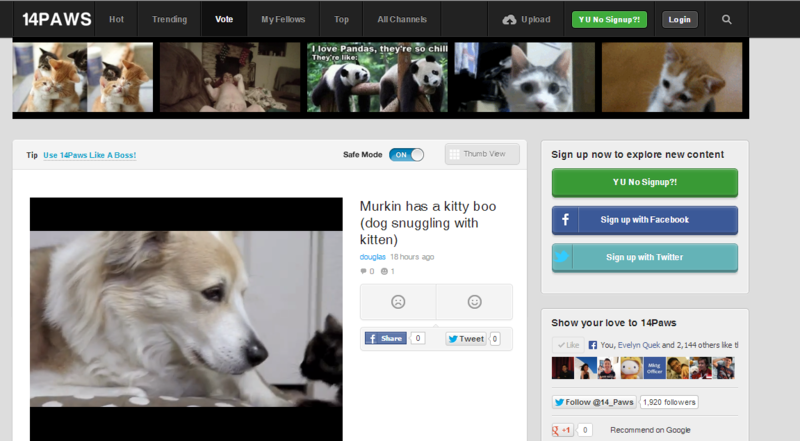 14 Paws14Paws.com shares the latest, best, and funniest animal videos for viewing enjoyment.